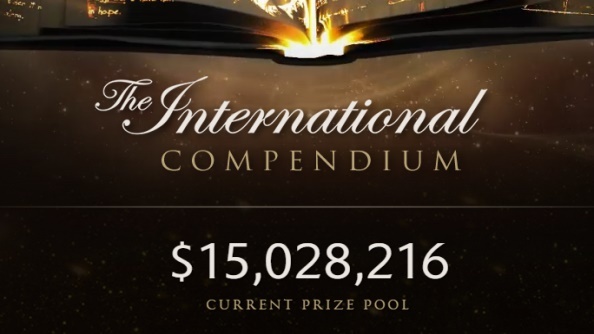 The International, Dota 2’s biggest tournament by a wide margin, went down last weekend, and it was the event’s best year yet. Having all sixteen teams make it to the main stage was a great change in the tournament format, since they all had a great story to make you root for them, and just about every set between teams had its standout moments. Even the between-match events were good this time (Deadmau5’s ill-fitting set after the grand finals notwithstanding). Valve has built something special here, and without sponsors it feels like an outpouring of love for their game instead of an ad for PC peripherals. But if you’re like me, you only ever learn anything about the world around you through the lens of videogames, so it’s important to pick up important life lessons where you can get them. So here are the most important lessons to glean from watching kids in their 20s play a videogame for more money than you’ll ever make in your lifetime, probably. Evil Geniuses’ roster, which ended up winning the entire tournament, featured a 16-year-old Pakistani youth named Syed “Suma1L” Hassan who at one point sold his bike so he could buy more time to play Dota at his local cafe. He’s the youngest person to ever win The International, and is now a certified millionaire. Dota 2’s audience is predominantly made up of players in their late teens and early twenties, putting him squarely at the lower end of his demographic. But while the game might favor Hassan’s incredible reaction times, there’s still room for slightly older players. Also on EG’s roster is Clinton “Fear” Loomis, the 27-year-old veteran featured in Valve’s documentary, Free to Play. Fear even had an arm injury last year and had to step down from the team during last year’s International, taking on the role of coach, making it less likely that he’d come back and do as well as he did. Multiplayer games are often pegged as a realm where you peak long before you can rent a car, so that someone who’s often dubbed “Old Man Fear” was able to take home first prize is, in a way, as impressive as Hassan’s story. 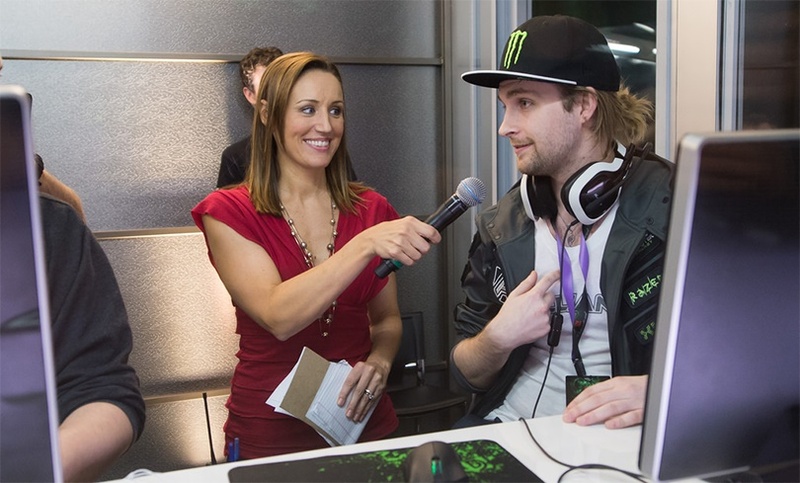 One of the International’s consistent highlights in recent years has been Kaci Aitchison, a news anchor and features reporter for Seattle’s Q13 FOX station who was a back-stage host for the tournament in 2013 and has been hosting the event proper since last year. Aitchison wasn’t too familiar with the game when she first signed on, but her distance from the scene and experience in local TV gave her a perspective on the event that allowed her to know which segments would entertain the average viewer. More importantly, Aitchison maintained a genuine curiosity with the game and its players during her first year, as opposed to the aloof and condescending mentality you might expect from the local news. This endeared her to the community, and you can now buy items in Dota 2 which bear her digital signature. She knows how to have fun with players and fans without poking fun at them, and it makes the entire event far more friendly and watchable. You could argue that putting this much of an emphasis on a single event is detrimental to the scene long-term, since it creates an entire “season” for one event that’s seen as the only tournament that matters. Valve hopes to spread this attention over the next year with its new majors program, which will feature three additional tournaments this Fall, Winter, and Spring to give fans and players something to look forward to regularly. But without the allure of a gigantic sum of money (I doubt Valve will be able to pull in $18 million every season), fewer people will probably take notice. Who knows how this will impact the scene, but it’s nice to see Valve changing things up. Perhaps the biggest upset of the tournament was Team Secret’s premature elimination. 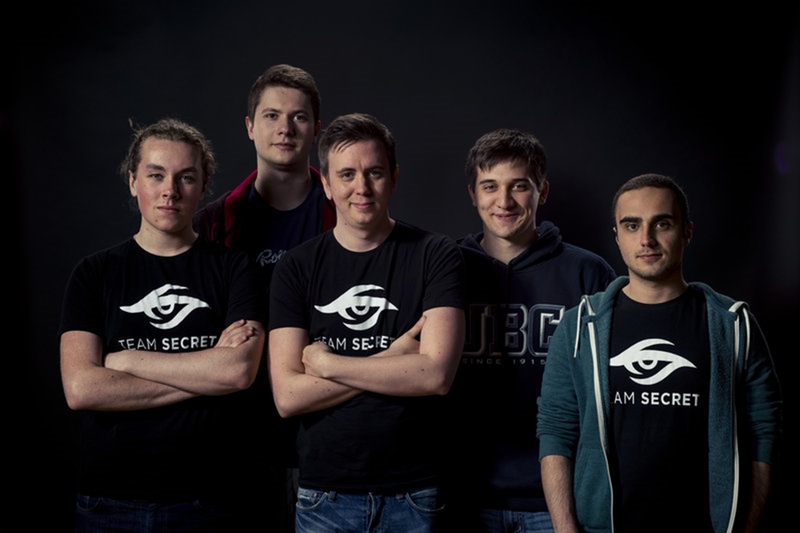 Secret, a “dream team” made of star players from other prominent teams, was the favorite to take home first place. After taking a top position during the group stages of the event, they walked out to their first match on the main stage in sunglasses, a move no one read as anything but cocky. “But if anyone deserves to do it, it’s them,” I thought as I watched them come out. Their attitude buried them. Many of their hero choices relied on greed, asserting that because of their skill level, they’d be able to pull off unsafe lineups. They preferred to give their players their signature heroes instead of attempting to counter the enemies, and while this is typically a valid strategy in the game, it failed them. Not only did their 3-5 record on the main stage make them look like novices, it may have shuddered the team prematurely, as there are already rumors that big changes to its roster are coming. So like many inspirational videos may have told you, your attitude can affect more than your mood. 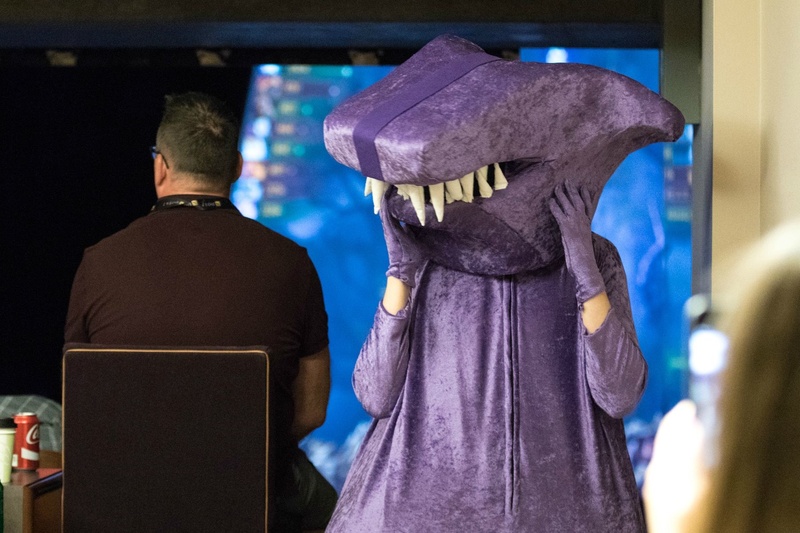 Despite Team Secret’s disappointing performance at The International, one of their players, Gustav “S4” Magnusson, displayed a great amount of humility and cheer when he dressed up as purple time dinosaur Faceless Rex and met with fans incognito. Similarly, Na’Vi’s Danil “Dendi” Ishutin put on a great show during the ten-versus-ten All Star Match. The reveal may have been a bit obvious in hindsight (Aitchinson picked Ishutin, dressed up as his signature hero Pudge, out from the crowd to participate in the All-Star Match), but Ishutin, another “Free to Play” subject whose team isn’t what it used to be, made a great case for himself as the game’s most charismatic player. But while some players showed themselves to be great role models for their fans, others… not so much. Post-tournament, players took to Twitter to poke some fun at each other, and the results weren’t so great (warning: slurs). Light poking though it may have been, it shows that these players, for all their technical prowess, are still teenagers and young adults, and may not be aware of their exposure to impressionable fans. 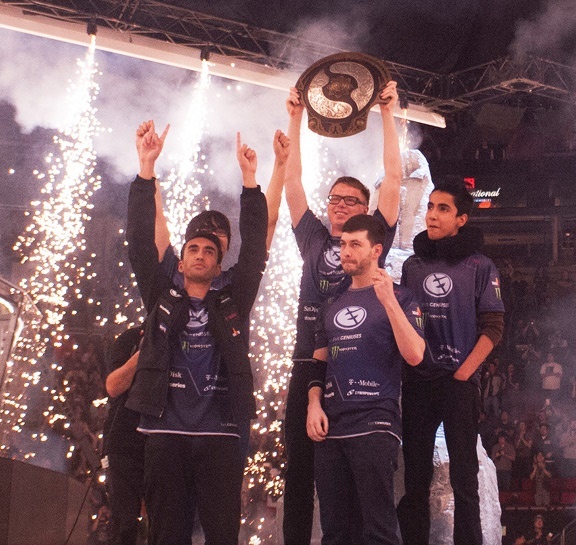 Photo from the Evil Geniuses website. Evil Geniuses took home first prize this year, and it’s a key milestone for a number of reasons. For one, it’s the first time a North American team has won the event, after teams from Europe and China swapped victories for the past four years. Through plenty of roster changes and dedicated practice, EG has worked their way up from being a joke in the scene (there’s a website dedicated to their tendency to lose matches they should have won) to taking top honors this year. It’s also important because it shows how fluid nationality can be when it comes to sports. Despite being an “American” team, EG’s lineup is made up of three Americans, one Canadian, and one Pakistani. This allowed pretty much anyone who wasn’t already cheering on the Chinese team CDEC Gaming to have a reason to root for them, whether they were American, North American, or Middle Eastern, or from the West in general. For professional gaming teams to take on the banner of their home countries isn’t new, but it’s certainly a strange thing to behold, watching people take a gaming competition and turn it into another outlet for nationality. Suriel Vazquez is a freelance writer who has to admit he was rooting for Team Secret and was as shocked as anyone when they lost. He’s written for Paste, GamesBeat, and several others. You can follow him on Twitter.